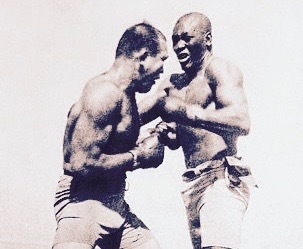 Legendary Heavyweight Champion Jack Johnson Vol.15. Life & Time of the legendary Heavyweight Champion Jack Johnson. Great Documentary of his life. Johnson was born the third child of nine, and the first son, of Henry and Tina “Tiny” Johnson, two former slaves who worked blue collar jobs as a janitor and a dishwasher to support their children and put them through school. His father Henry served as a civilian teamster of the Union’s 38th Colored Infantry, and was a role model for his son. As Jack once said, his father was “The most perfect physical specimen that he had ever seen,” although his father was only 5 ft 5 in (1.65 m) and left with an atrophied right leg from his service in the war. Growing up in Galveston, Texas, Johnson attended five years of school and was known as a bright, talkative, and energetic kid. Like all of his siblings, Jack was expected to work to keep the family going while he was growing up. He helped sweep classrooms to ease the work for his father, and he worked for the local milk man before school, taking care of the horses while the milk man got off to make deliveries. For this work he was paid 10 cents and a red pair of socks, which his boss had a seemingly endless supply of, every Saturday. Although Jack grew up in the South, he said that segregation was not an issue in the somewhat secluded city of Galveston, as everyone living in Galveston’s 12th Ward was poor and went through the same struggles. Johnson remembers growing up with a “gang” of white boys, in which he never felt victimized or excluded. Remembering his childhood, Johnson said, “As I grew up, the white boys were my friends and my pals. I ate with them, played with them and slept at their homes. Their mothers gave me cookies, and I ate at their tables. 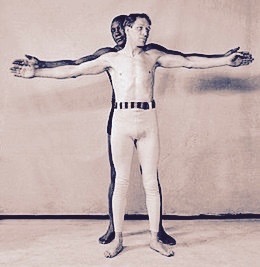 No one ever taught me that white men were superior to me.” Jack carried this mentality to his boxing career, as he would not be intimidated to fight any man, no matter their race. During his days as a child Johnson was a frail young boy and not much of a fighter, as he grew up under the protection of his two older sisters until he was twelve years old. Jack was usually able to avoid quarrels until he was twelve years old, and was confronted by a boy who hit him on the jaw. About to run away from the quarrel Johnson remembers Grandma Gilmore, or his mother (the story varies by whomever tells it), who told him, “Arthur, if you do not whip Willie, I shall whip you.” After winning the fight, Johnson developed a new mentality, and toughness to carry with him through his life. After Johnson quit attending school, he began a job working at the local docks, soon discovering that he hated it. He made several other attempts at working other jobs around town, until one day he made his way to Dallas, finding work at the race track exercising horses. Jack stuck with this job until he would find a new apprenticeship for a carriage painter by the name of Walter Lewis. Lewis, who had a passion for boxing, enjoyed watching friends spar, and although boxing was somewhat new to Johnson, he began to learn how to hit hard and strong. Johnson later claimed that it was thanks to Lewis that he would become a boxer. After returning home for a short period of time, Johnson once again left at the age of 16, this time heading for Manhattan. While in Manhattan, Jack found living arrangements with Joe Walcott, a welterweight fighter from the West Indies. Once again Johnson found work exercising horses for the local stable, until he was fired for exhausting a horse. Soon finding employment as a janitor for a gym owned by German born heavyweight fighter, Herman Berneau, Johnson eventually put away enough for two pairs of boxing gloves, sparring every chance he got. Throughout his time in Manhattan, living with Walcott and working for Berneau, Johnson began to develop his unique style of fighting which would make him famous. Returning home from Manhattan a much bigger and stronger man, Johnson quickly got a chance to test his new fighting skills in a quarrel against a man named Davie Pearson. Johnson remembers Pearson as a much more “grown and toughened” man, who accused Jack of turning him in to the police over a game of craps. When both of them were released from jail, they met at the docks, and were set to fight in the midst of a large crowd. After beating the much bigger, older man Johnson began to think that he could make a career out of his skills as a fighter. Johnson soon got his chance fighting in a summer league against a man named John “Must Have It” Lee. Because prize fighting was illegal in Texas the fight was broken up, and moved to the beach where Johnson won his first fight, and a prize of one dollar and fifty cents. Though this fight was just a small steppingstone in Johnson’s career, he returned home confident in his career as a prizefighter, and began his journey towards a historic career in the sport. Johnson made his debut as a professional boxer on November 1, 1898, in Galveston, Texas, when he knocked out Charley Brooks in the second round of a 15-round bout for what was billed as “The Texas State Middleweight Title.” In his third pro fight on May 8, 1899, he battled “Klondike” (John W. Haynes or Haines), an African American heavyweight known as “The Black Hercules,” in Chicago. Klondike (so called as he was considered a rarity, like the gold in the Klondike), who had declared himself the “Black Heavyweight Champ,” won on a technical knockout (TKO) in the fifth round of a scheduled six-rounder. The two fighters met again in 1900, with the first contest resulting in a draw as both fighters were on their feet at the end of 20 rounds. Johnson won the second fight by a TKO when Klondike refused to come out for the 14th round. Johnson did not claim Klondike’s unrecognized title. On February 25, 1901, Johnson fought Joe Choynski in Galveston. Choynski, a popular and experienced heavyweight, knocked out Johnson in the third round. Prizefighting was illegal in Texas at the time and they were both arrested. Bail was set at $5,000 which neither could afford. The sheriff permitted both fighters to go home at night so long as they agreed to spar in the jail cell. Large crowds gathered to watch the sessions. After 23 days in jail, their bail was reduced to an affordable level and a grand jury refused to indict either man. However, Johnson later stated that he learned his boxing skills during that jail time. The two would remain friends. 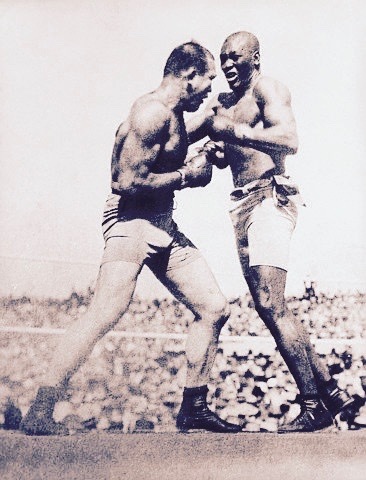 Johnson beat former black heavyweight champ Frank Childs on October 21, 1902. Childs had twice won the black heavyweight title and continued to claim himself the true black champ despite having lost his title in a bout with George Byers and then, after retaking the title from Byers, losing it again to Denver Ed Martin. He still made pretence to being the black champ and claimed the unrecognized black heavyweight title as well. Johnson won by a TKO in the 12th round of the scheduled 20-rounder, when Childs’ seconds signaled he couldn’t go on. (He claimed he had dislocated his elbow.) The defeat by Johnson forever ended his pretensions to the black heavyweight crown. 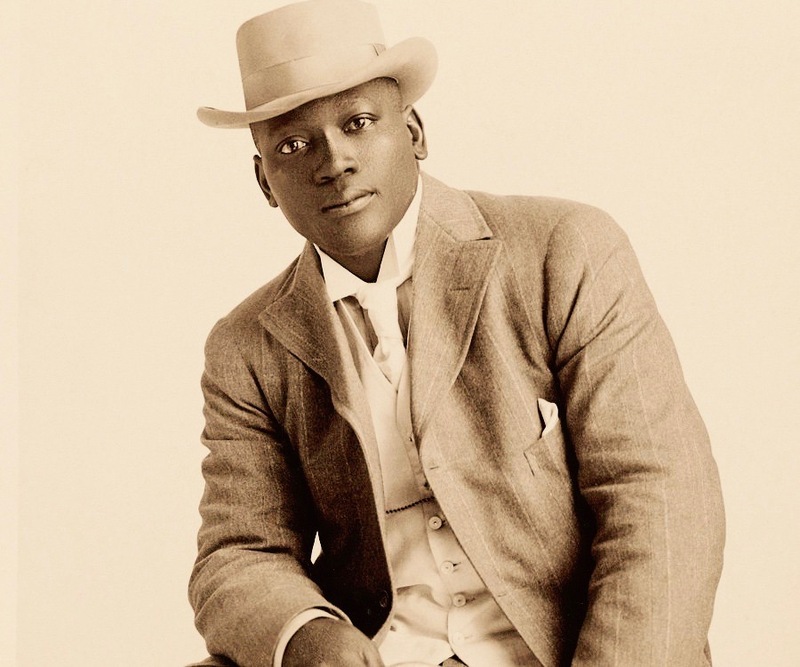 By 1903, though Johnson’s “official” record showed him with nine wins against three losses, five draws and two no contests, he had won at least 50 fights against both white and black opponents. Johnson won his first title on February 3, 1903, beating Denver Ed Martin on points in a 20-round match for the World Colored Heavyweight Championship. Johnson held the title until it was vacated when he won the world heavyweight title from Tommy Burns in Sydney, Australia on Boxing Day 1908. His reign of 2,151 days was the third longest in the 60-year-long history of the colored heavyweight title. Only Harry Wills at 3,103 days and Peter Jackson at 3,041 days held the title longer. 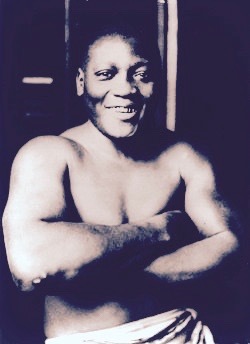 A three-time colored heavyweight champion, Wills held the title for a total of 3,351 days. Johnson defended the colored heavyweight title 17 times, which was second only to the 26 times Wills defended the title. While colored champ, he defeated ex-colored champs Denver Ed Martin and Frank Childs again and beat future colored heavyweight champs Sam McVey three times and Sam Langford once. He beat Langford on points in a 15-rounder and never gave him another shot at the title, either when he was colored champ or the world heavyweight champ. To learn more about Jack Johnson go to the link below.